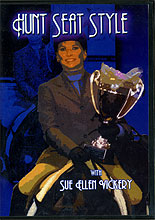 Since childhood, multiple world champion Sue Ellen Vickery has devoted her life to the field of equestrian achievement. As a professional trainer and coach, Sue Ellen has a passion for developing the exceptional hunt seat horse and schooling the aspiring hunt seat rider. Sue Ellen is no stranger to the show ring. Winning multiple championship titles as a youth rider, today she is sought out by horse owners to train and coach both horse and rider to the winner's circle. Here in this exceptional video, Sue Ellen takes you behind the scenes to show you her captivating style for showing hunt seat style horses. She will demonstrate and guide you through developing a rhythmic, relaxed way of training and showing your horse at all three gaits. You will discover secrets of the trade and along with her experience and expertise, share her knowledge as she helps you find your HUNT SEAT STYLE.